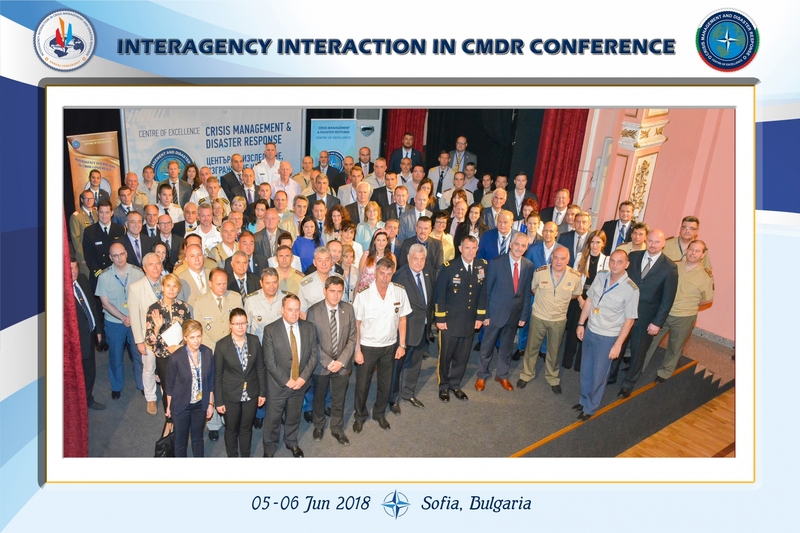 The CMDR Interagency Interaction Conference is an annual event, which was held on June 5-6 in the Central Military Club, in Sofia, Bulgaria. The Conference brought together subject matter experts and various actors working in the crisis management and disaster response domain. The CMDR COE Annual Conference serves as a platform for information and knowledge exchange and facilitates coordination of actions among key stakeholders, both military and civilian, in the CMDR domain. Each year the event addresses specific issues from the latter domain and gathers experts from across NATO Allied and Partner countries. The 2018 Interagency Interaction in Crisis Management and Disaster Response Conference focused on the following topics: Climate Change - Security Nexus, Future Crisis and Disaster Response Operations, and Best Practices in Support of CMDR Decision-Making. The key-note speakers at the annual event were MG William HICKMAN, Deputy Chief of Staff, Strategic Plans and Policy in Supreme Allied Command Transformation (SACT); Vice Admiral Emil EFTIMOV, Deputy Chief of Defence, BGR; Mr. Iain RICHMOND, NATO HQ, Brussels and Mr. Dirk DUBOIS, Head of the European Security Defence College, Brussels. More than 160 representatives of 14 nations, national and international organizations and institutions took part in the Annual Conference. CMDR COE was pleased to host participants from ACT, NATO COEs, Bulgarian JFC, Bulgarian Air Force, the Bulgarian Academy of Sciences, Rakovski National Defense College, Vassil Levski National Military University, Nikola Vaptsarov Naval Academy, University of Security and Economics, Bulgarian Modeling and Simulation Association – BULSIM among others. The Conference opening address was delivered by the Chief of the Political Cabinet of the Minister of Defence, Mr. Iliya Nalbantov who noted that CMDR COE has broadened the spectrum of its partnering organizations, as for the first time this year the event featured а 2-day workshop on Security Capability Development. More than 40 security and defence professionals from the Marshall Center brought their knowledge on the table and discussed the security and defence capabilities development issue in the context of the recently adopted update of the National Security Strategy of the Republic of Bulgaria. In his opening address Vice Admiral Emil Eftimov, Deputy Chief of Defence, expressed his confidence that international coordination of joint efforts in crisis management and disaster response can be effectively achieved through flexible and mutually beneficial cooperation and that the Centre, its management and staff members, possess the necessary capacity to contribute substantially to this end. Vice Admiral Eftimov noted that events such as the present conference are undoubtedly important milestones in implementing this priority. Throughout the two-day Conference, the recurring idea of thinking globally while working locally, as well as the need for unity and cohesion, synchronization of efforts, CMDR procedures and training, have underscored the way ahead for facing current and future NATO security challenges and threats. The productive work and the lively discussions have led to achieving the objectives of the CMDR COE Annual Conference, as well as the exchanging of ideas among the actors involved in the crisis management domain, providing opportunity for the experts to present their work and to share experience and facilitate cooperation between research institutes and governmental organisations.